Make a smart investment by upgrading your home with hardwood flooring. This type of flooring dramatically enhances the value and ambiance of your home. It has a universal appeal due to the rich color, enduring strength, and timeless style it provides. With the proper care and maintenance, your wood flooring provides you with decades of beauty and comfort. Each of these varieties of wood floors is available in both solid and engineered hardwood. Once you decide on the type of wood you want, you can select from a number of glosses, variations, and shades. With the choices we provide you and the available design possibilities, there is no limit to the bounds of your imagination. Do your floors reflect your style and home décor? Every home is different, and everyone has a different outlook on what they find the most attractive when it comes to wood flooring. If you have questions regarding the best wood flooring option for your home, our experienced sales team is here to help. When you visit our showroom, a sales specialist will ask you important questions about your family’s lifestyle. This can make a huge difference when choosing a type of hardwood flooring that works best with your needs. If you have a distinctive design theme that you are working with, our sales team matches that theme with the right variety of grain and pattern. Don’t wait until it’s too late to get the right type of wood for the room you are renovating. Bring your ideas to us we can find a floor that matches it as closely as possible. When you need new flooring for the formal spaces in your home, choose a smooth wood with a high gloss. This option provides modern look that sets the standard for style and elegance among your neighbors. For a more rugged look that reflects the natural beauty of the great outdoors, choose from our selection of handscraped hardwood. This flooring includes chatter marks that add an authentic look of charm and warmth. Hand scraping adds a rich character to the Buckhorn birch hardwood from Floorcraft(TM) that we offer. This versatile variety of hardwood is perfect for any room in the home, and the lighter hues make it a great option for a more modern look. For a polished country charm that enhances the appeal of any room, choose an option like our Lead Hill hickory flooring from Floorcraft. This variety of flooring works perfectly with a wide array of interior decorating styles and retains its appeal for years to come. Decide first whether you want solid or engineered hardwood. 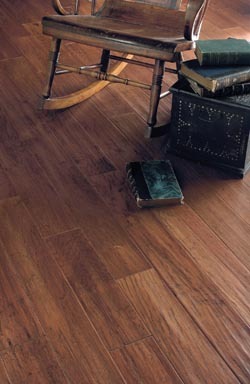 Solid hardwood is a luxurious option known for its unrivaled richness and sophistication. Made from a single piece of wood, it also has incredible longevity. You can refinish or re-stain your solid wood flooring years down the line, and it will have that same showroom sheen it had when it was brand new. Solid hardwoods are also easier to clean than other types of flooring on the market today. Character and convenience go hand in hand with the solid and engineered hardwood we offer every day. Engineered floors are composed of multiple layers, including a piece of natural hardwood that acts as the top surface. Customers choose engineered hardwood floors because they have exceptional strength and resist warping. This is particularly important if you plan to install wood flooring in an area with a lot of moisture or humidity. Engineered flooring is also excellent for more budget-conscious floor shoppers. A great example of the reliability of engineered wood flooring is the Northern Red Oak from Downs Performance Wood. With unmatched performance and exceptional construction, it’s no wonder that more and more homeowners are adding this highly rated variety of hardwood flooring to their new homes. Both engineered and solid wood are easy to clean and maintain, so they retain their original appearance with minimal upkeep. Unlike other flooring options like carpeting, hardwood floors won’t fade and deteriorate with constant traffic. This allows you to maximize your design dollar, while saving time and money for years to come. Wood floors are also eco-friendly, as they are made from a renewable resource. They require far less energy to produce than other flooring types and that reduces your impact on the environment. Adding hardwood floors to your home will give it an all-natural appeal while simultaneously helping the environment. Get your floors installed by the professionals at our store. We offer full-service hardwood flooring installation. Our installers are certified and highly experienced. You can count on them to put your new flooring in the right way so it fits the room seamlessly. Professional installation can make a huge difference in the appearance and lifespan of the flooring in your home. If you're worried about the cost of buying and installing new hardwood floors, don't worry! We offer 12 month finanacing options to all of our customers. When the material is securely attached to the sub-floor, and the surface is perfectly level, you can extend the life of your flooring investment. Avoid warping and damage from moisture when you get your new hardwood flooring installed in the right way. Contact us today and transform the look and feel of your home with hardwood flooring that lasts with 12 months financing available. We're proud to serve customers throughout Painesville, Lake County, Mentor, Concord, Willoughby, East Lake, and Willowick, Ohio.